The view is from Jersey City looking across the water into the financial district of Manhattan, where you can see One World Trade Center (Freedom Tower) being constructed. Not too shabby huh? I’m not sure if they wanted some anonymity so we won’t mention the company name yet, but thanks to Carlos and Robb for sending us this awesome Mac setup! It looks like there’s a Bloomberg terminal just out of the shot to the left, and the office view is very similar to a corner in the Goldman Sachs tower. Good stuff! FAIL! because of the keyboard ! Ew, no kidding! That keyboard is godawful! Bloomberg requires fingerprint authentication last I knew and it would require their keyboard. Great setup ! But wtf is up with that awful keyboard ! It seams IT dept/designers decided to make CEO blind simply by positioning monitors. 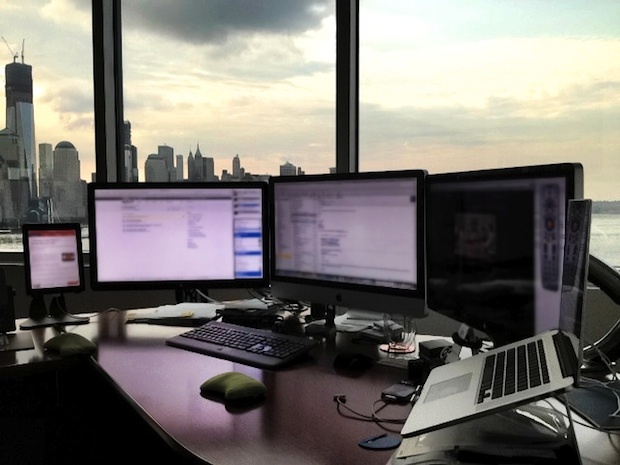 iMacs or Apple displays are bad choice for the glass wall-windows environment where it is hard to find a place for a glossy screen to make work comfortable (which is nearly impossible anywhere). Personally I would love to have just one 27″ Apple display on my desk … or a 27″ iMac … or a Retina MacBook Pro … or an iPad 3. Tight budget but want a 27″monitor 2560×1440? I got a catleap and a monoprice dual link dvi adapter for my macbook air. Very happy! This is a view from NJ. Fail.